2BE1 series Liquid ring vacuum pump are the products with high efficiency and energy saving, which are manufactured by our company combining with the advanced technology of the imported products. 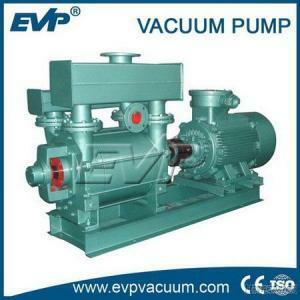 These series pumps are single stage and single function structure and have many advantages. Such as: structure is simple, easy to maintain and reliable operation and so on. They can used to the large of water drainage and load shock wave and other hard conditions. Compare to the SK, 2SK, SZ series Liquid ring vacuum pump are widely used in our country at present, 2BE1 series are the ideal replacement with high vacuum, low power, and reliable operation. 1, All bearings adopt the imported products with Japanese NSK to ensure the precise orientation of impeller and high stability during the running. 2, The material of the impeller is welded with nodular iron or steel to ensure the high stability and increase the lifetime of the pump greatly during any harsh conditions. 3, The pulley (when the pump is driven by the belt) adopts standard high precise taper bushing pulley to keep the reliable running and increase the lifetime; also it is easy to dismantle. 4, The coupling (driven directly) adopts standard high strength elastic product. The elastic element is made of polyurethane to keep the reliable operation and long lifetime of the pump. 6, The shaft sleeve as the most easily damaged part, our shaft sleeve is made of stainless steel to increase the lifetime of the pump 5 times than normal material. 7, Special separator built-on the pump can save the space and reduce the noise efficiently. 8, All the parts are cast by the resin sands with great quality, no puttying. Keep the heat dissipation is the best. 9, The mechanical seals (optional) adopt the imported parts to fully ensure the pump in the long-running process without leakage.